Catering can be an extremely lucrative business. 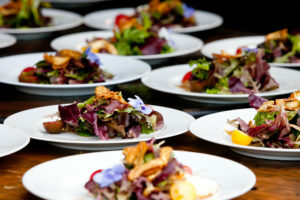 The variety of events, which often require a caterer, are diverse. From weddings to funerals, corporate events or graduations, finding a caterer often makes the top of the to-do list. As an established restaurant, adding catering to your provided services can benefit you in multiple ways. Catering gives you a hand up over your competitors. Perhaps your restaurant is one of many Italian restaurants within a city; however, if yours is the only one which offers catering as a service, instantly you have an edge over your competitors. It gives you a new angle for marketing because you can promote your establishment in a different way than before. Catering also allows you to reach a wider audience. It gives you the chance to promote your restaurant to people who are perhaps from out of town, live in a different neighborhood or just haven’t heard about you. The events that require a caterer are most often quite large and varied. This helps promote your restaurant to a more diverse group of people. Finances can be another pro to adding catering to your list of provided services. Catered events typically take place in the evening or on the weekends. This can be an excellent opportunity to fill potentially slower business hours with a catered event. Not only will you be promoting your restaurant, it also gives you the chance to make extra income you may have not otherwise earned. Catering can be fun as well! If you have a very traditional menu, catering can give you the room to explore and try something new. Event hosts may also have a specific dish they want at their event, giving you the chance to try something different. Through these new experiences, you can also gather new ideas and recipes to make dining at your restaurant even more enjoyable.